Do you own land which you may wish to bring forward for development by 2031? The Parish Council is looking for land in or adjacent to Bringsty and Linton which could be included in the Neighbourhood Development Plan to help meet housing and other needs up to 2031. Visit our NDP page for further information including a Site Submission Form. If you have land which you think might be of interest, please get in touch. Completed site submission forms must be returned by 28th February 2019. To hear about the results of our recent household survey, come along to the next NDP Steering Group meeting: 6:00PM on Wednesday 20th February at the Bromyard and Winslow Town Council offices, Rowberry Street, Bromyard. There is also a summary of the results on our NDP page. Replacement notice boards have been installed near to Brockhampton Primary School and at Burying Lane, to keep parishioners up to date with parish council business. 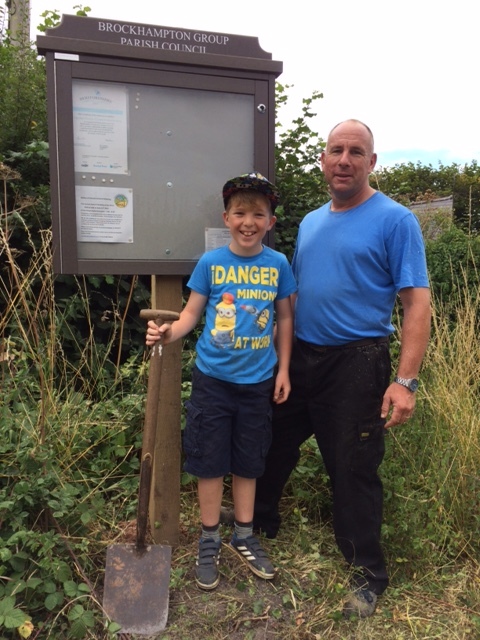 The parish council would like to thank Hugh Davis and his young apprentice Sam for their work installing the boards. Bringsty Common Manorial Court has commissioned a consultant to examine different options for the future management of Bringsty Common. The questionnaire is being distributed by hand to all Commoners. Please do respond to this document, it is important that your views are heard. In addition Ann Cantrell will be coming to the next Manorial Court Meeting on Wednesday 12 September at 7.30 pm at Whitbourne Village Hall. All are welcome to attend. Brockhampton Group Parish Council maintains a burial fund to ensure that those who are residing at the time of their death in the parishes of Brockhampton, Linton or Norton are able to ask for financial assistance for burials in the Bromyard and Winslow Cemetery. For further information contact the Parish Clerk.